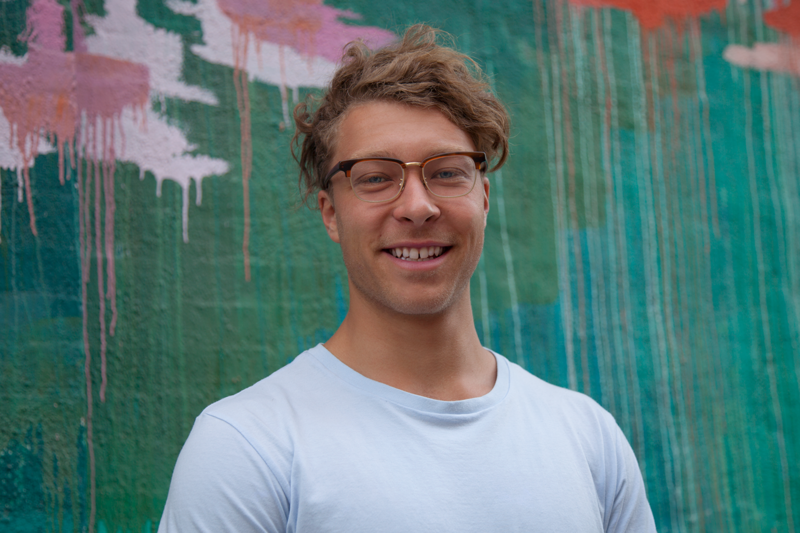 ‍Samson Klitsner recently joined Oblong Industries as an interaction designer on the Solutions team. He discusses the process behind his first project with Oblong and tells us why it turned out to be a joke. Across the verbose landscape of tech/design buzzwords, humor is one of the essential human expressions that doesn’t seem to be used often enough. As a tool for breaking down communication barriers, humor is something that often comes naturally in day-to-day conversation, but can be easily overlooked when creating client-facing work. Working from within an environment that strives to humanize digital interactions, our goal is to make sure that these moments are not only possible, but encouraged. a video player interface held together with hairbands and lollipop sticks that takes the form of an antiquated media format. If that sounds funny, then it was a success—my first client-facing project turned out to be a joke. We have longterm relationships with many of our clients, who are familiar with the range of immersive interactive experiences we have designed and built. They use our wands in high-end executive briefing centers to move content across multiple displays and other large-scale environments. In the case of TapeDeck, we wanted the client to understand the power of tangible interface—to think beyond the large display wall. and then broadcast to the room. g-speak treats multiple connected machines as integral parts of a single room-scale interface. When the message is received on a machine, a corresponding video plays on its display(s). , and many more. While this capability might seem apparent in the abstract, we wanted to make it real. This is what was really being showcased, and also where the punchline lies. Analogies and metaphors are strong tools for communicating new ideas, and a strategy Oblong uses regularly. Apart from the fact that analog has been making a comeback, the metaphor of the tape deck as media device is instantly recognizable. Pete slid out the tape and dropped in another, prompting the next video to play. Again the action was met with amusement. Following the presentations, the designer from Oblong, a company that pushes for the next generation of digital collaboration, used an old sponge to “clean” the video stream. There was a roar of laughter from the conference room. You don’t have to be familiar with g-speak, Mezzanine, or Arduino to understand this part of the joke. Was it gimmicky? Yes. Effective? Absolutely. Aristotle made the observation that humor is “… something unexpected, the truth of which is recognized.” The truth in this case is expressed by an RFID tag encased in a dried up sponge. Sitting on its own, Tape Deck is really not that funny to look at. It requires a human touch and some comedic timing to set up and deliver the punchline. We use design across all fields to clearly communicate capabilities of our technology, and humor is a model of efficiency. Bringing a demo like Tape Deck into the meeting not only allows us to create an understanding using a visual reference; it sets the stage for a slapstick performance, provoking laughter and making human connections. 1. Salvatore Attardo (1994). Linguistic Theories of Humor. Walter de Gruyter. pp. 20–. ISBN 978-3-11-014255-6.